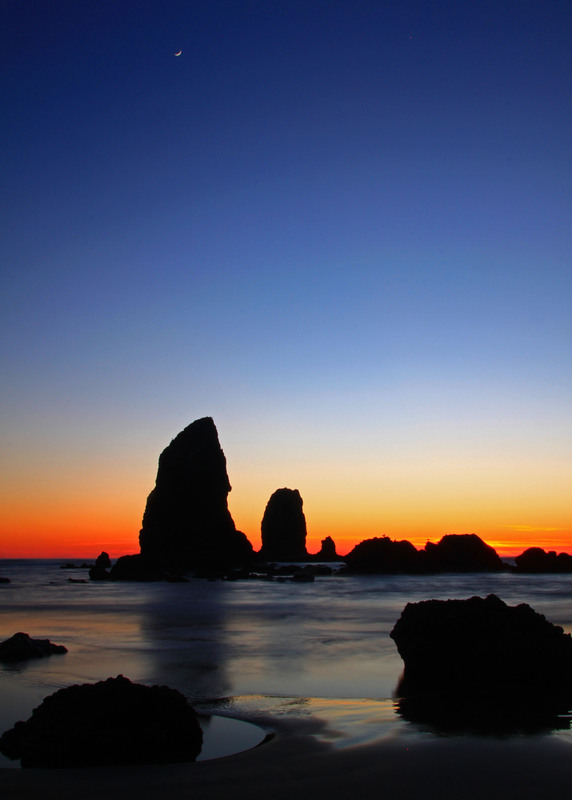 This photo may be the last clear sunset shot at the Oregon Coast for 2014. Oregonian’s know that Fall and Winter bring the most dynamic and amazing sunsets but unfortunately they are hard to come by and you have to ask for a little luck. One of my favorites reasons for going to the beach, during the cold months, is that sunset is between 4:30 and 5:00 pm but if you go on a day when the skies are clear you will wish that you had more time to explore and take in the sights. To get this shot I made sure to use my tripod, bubble level and remote switch. However, I didn’t bring my ND filter so I wasn’t really able to set the exposure time for more than two seconds. I did attach my CIR PL, warming filter and UV filter in order to take advantage of the warming tones as well as remove any unwanted noise. The one thing to remember is that when you are taking sunset shots, during the month of November, the sunset comes and goes lightning fast so you want to be sure and keep on your feet. Luckily, there are usually less people so you will normally have the opportunity to move about more freely without running into people or finding them standing in your way. The tides are also much more aggressive and the swells move in and out pretty quickly so you will want to keep that in mind since you may find yourself getting caught in a fast moving swell as you take that epic shot. The most important thing to remember is to think outside the box and stay creative since you can sometimes get that perfect shot when you least expect it. I was really impressed with the crashing waves moving left to right once they reached the beach so I waited for the best chance to get this particular shot. I really liked the way the water was dancing just above the beach but at a very fast pace. Even though I couldn’t set my camera to shutter priority, I was able to keep the aperture at only F-4, which allowed me to get the movements of the waves as well as the colors of the skies drenched in reds, yellows and orange. I also made sure to keep the ISO at 100, the WB at 0 and held the shutter speed at 1/60 second. I was using my Canon T1i and attached my Sigma 17-70mm lens and set the focal length at 42mm in order to frame each of the rocks in the shot. Since I only shoot in jpeg mode I was able to keep the photo at only 1.67mb, which keeps it from being too big. The next several days is calling for some pretty rainy weather but I would recommend checking the weather for the next sunny days and take advantage of sunset opportunities like this. 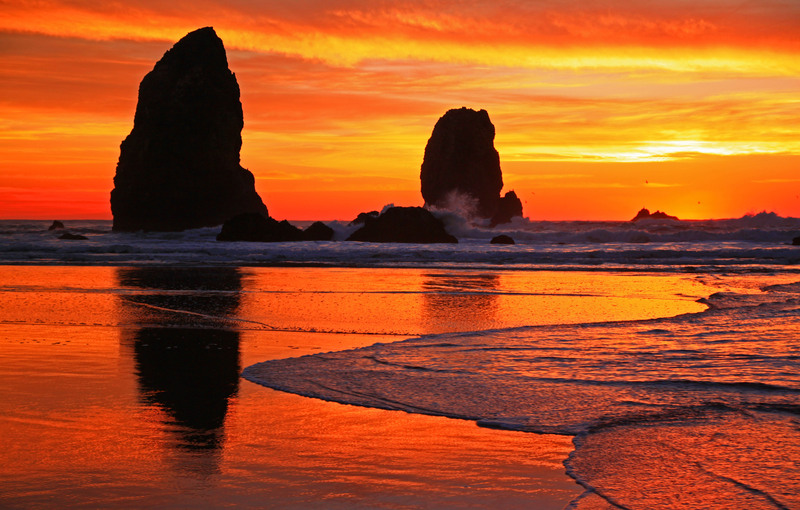 [/caption] You can get some pretty amazing sunset shots at Cannon Beach, OR but the sunset last Saturday was a day to remember. The daytime temperature was 78 degrees and the temperature at sunset was 65 degrees with no wind and not a cloud in the sky. It was short sleeve and shorts kind of weather in May. However, the sunset was even more epic than the weather. The sunset took on the look of a massive nuclear explosion off the Oregon coast with a cascade of orange, yellow and cloud tracers shooting across the sky. The photo pretty much speaks for itself. I did add a lot to the color in photoshop but the raw photo was still pretty awesome. I wanted to really create an intense emotion so I went to town by darkening the highlights and saturating the colors. I ended up with over 75 photos just like this one with some better than others. This is why I live near the Oregon coast. You get the most amazing sunset shots anywhere on the planet. To get this shot I was using my Canon T1i and attached my Sigma 17-70mm lens. I attached my ND4, CIR-PL, warming and UV filter in order to reduce the glare from the intense sun. I made sure to use a tripod, bubble level and remote switch in order to avoid any camera shake or blur. Sunset was at 8:38pm and this particular shot was taken at 9:03pm. The sky literally lit up just before it set and the colors just got more intense as it lowered below the horizon. I wanted to post a panoramic photo so I set the focal length at 19mm since 17mm was too wide and the corners were vignetted due to the ND filter being attached. I had the camera in shutter priority and set the ISO at 100 and the white balance at -1.3. I also wanted to get a nice ghosting effect from the water so I set the shutter speed at 10 seconds. This also caused the aperture to be automatically set at F-22. It was high tide so I wasn’t able to get near the tide pools but I was able to take advantage of the reflection of the rocks and the fast moving water. 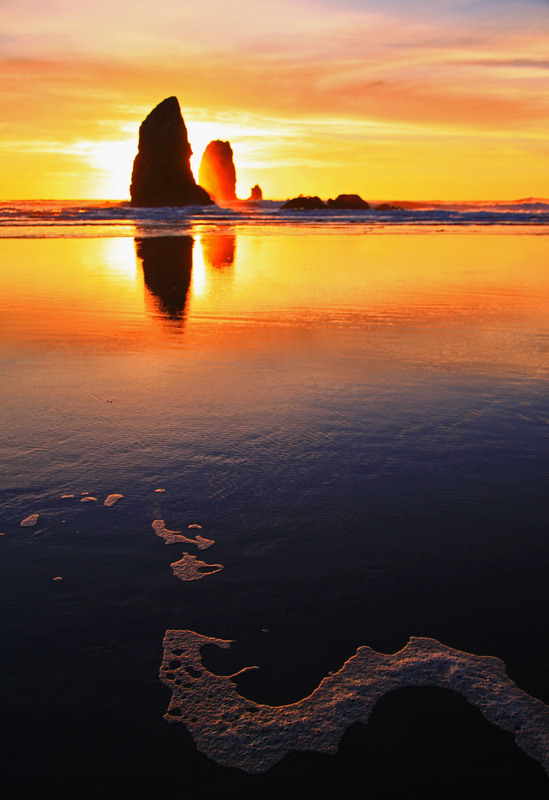 [/caption] Sunsets along the Northern Oregon coast can surprise even the most seasoned photographer or local residents. The most important thing is to have the clouds on the horizon to allow the sun to set below the Pacific Ocean without being obscured from any oncoming cloud formations. After that, you have no idea what the sunset might look like. On this particular sunset, the sun was partially obscured by the approaching clouds and some light fog had moved in and around the rocks. This caused the rocks to appear as though they were almost floating in mid air. The clouds high above looked like pop corn being strewn along the sky. This was one of the most entertaining sunsets that I had ever witnessed and I was caught off guard, which caused me to almost panic and just start taking photos without having any real plan. The tide was also pretty high, so I wasn’t able to get too close to the rocks and tide pools. This meant that I had to stand pretty far back but at least I was able to this this type of shot with the reflection of the rocks and the varying colors of the sky and beach. I was using my Canon T1i and attached my Tokina 12-24 wide angle lens. I also attached my warming filter and CIR-PL in order to keep the shutter priority open. I made sure to use my tripod, bubble level and remote switch in order to avoid any camera shake or blur. Since I put the camera mode at shutter priority, the aperture was set at F-22 and I set the speed at 13 seconds. The focal length was at 15mm in order to get the most panoramic photo as possible without having too much empty space past the rocks on either side. The ISO was set at 100 and the white balance at -2 due to the glare from the water. This photo was taken on 9/3/10 and it was about 7:30pm. The sun had set around 6:30pm so the color contrast was almost perfect but unfortunately the fog hovering around the rocks made it challenging to get the best shots. It also helped that I didn’t have any problems with other photographers or beach combers walking in front of me. In fact, I can’t really remember why I was able to get so many of these far away panoramic shots without having an issue with people getting in the way. [/caption] Cannon Beach offers so many photography opportunities that it’s almost impossible to be comfortable with just a few photos. Haystack rock and the Needles has a million different personalities and you can consider yourself lucky to photograph them on their most unique days. This particular shot was taken on 7/5/11 and the entire fourth of July weekend had some of its warmest temperatures on record. The skies were completely void of any clouds but on this day, clouds were seen streaming northward in the later parts of the day. By the time the sun had set the clouds were traveling at such a high speed that I decided to create a long exposure and see if I could include the clouds and surf. It was already 9:40pm so I was able to remove my ND filter as well as my CIR-PL but left my warming filter on in order to warm the purplish colors in the background. I was using my Sigma 17-70mm lens and had the focal length at 17mm so I could create a panoramic view of the rocks. The aperture was at F-8 since I kept the ISO at 100 and reduced the white balance to -1. I set the shutter exposure to 13 seconds in order to get the effect of the fast moving clouds as well as the slow moving surf. The sky gives off a purplish hue and the blur of the clouds and water give it a mystical look. I was fortunate that there wasn’t much of a wind and the sea birds seemed to stay at bay for the most part. [/caption] Summertime along the Oregon coast is one of the best times to enjoy the beaches and tide pools. Though the weather can be unpredictable, when you have the opportunity to experience the beaches when the weather is nice you are sure to be impressed. The summer usually guarantees a descent to perfect sunset and the same goes for most sunrises. Because the sun sets after 9:00pm you are more likely to have the opportunity to photograph the rocks surrounding the beaches without having to rush your shots. Low tide normally offers the best opportunities since you can walk along the tide pools and include the smaller rocks that would otherwise be submerged beneath the water during high tide. I took this shot using my Sigma 17-70mm lens and had the focal length at 19mm in order to maximize the field of view in order to ensure that the entire photo was in focus. I also wanted to highlight the rocks as they move towards the horizon. I had attached my CIR-PL and warming filter in order to avoid too much overexposure due to the brightness of the sun. In fact, I was standing behind Haystack rock in order to block out the sun since it was about 15 minutes before sunset and the sun was blinding. I had the camera in shutter priority and set the shutter speed to 4 seconds. The aperture was automatically set at 19mm since I had the ISO at 100 and the white balance at -1.3. I made sure to use my tripod, bubble level and remote switch to avoid any camera shake or blur. I was hoping to find some bright starfish clinging to some of the rocks but the only starfish I saw was in the sand just below the photo.